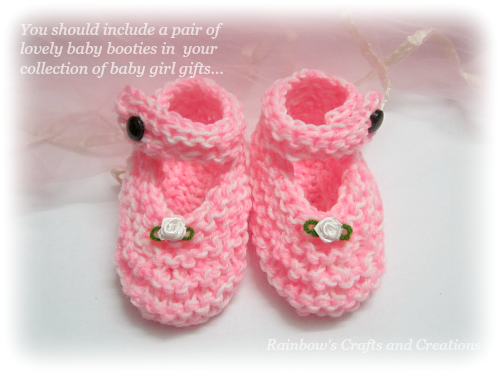 This is my another knitting pattern for baby booties. It will creates a very attractive garter stitch texture. I knitted these baby booties with double-yarn. This pattern calls for two skeins of yarn (pink & white), use a strand of each skein at the same time and you have to treat these two strands as if they were a single strand while knitting. It is very easy and fast to get it done. If you are not interested in this granular look baby booties, you can try out another simple knitting pattern for baby booties. Now, you have two sets of 7sts on your needle. Row 15 - 17 : Knit 3 rows. Bind off and cut yarn about 12" to sew with. Rejoin yarn at where you started binding off the 12 sts and cast on 9 sts tightly. Rejoin yarn at where you started binding off the 12 sts. Row 15 - 17 : Knit three rows. Finishing : Fold bootie with wrong side together and using the method of sewing invisible seam for garter stitch to sew up the heel seam. Then continue sewing the cast on edges (bottom edges) together with the whipstitch. Weave in yarn ends. Sew button opposite buttonhole on strap. Note: attach button or any decorative accessories securely to avoid choking.